The canine knee joint, known as the stifle joint, is similar to a human’s knee. The joint is made up of the femur (thigh bone), tibia (shin bone), and the patella (kneecap) that are firmly held together by ligaments. Ligaments are strong, dense structures consisting of connective tissues that connect the ends of two bones across a joint. The function of ligaments is to stabilize the joint. The stifle has two very important ligaments called the cranial (CrCL) and caudal (CaCL) cruciate ligaments (cruciate means a cross or crucifix) that cross in the center of the joint. The CrCL (known as the ACL in humans) restrains the backward and forward motion of the joint, in addition to inward twisting and hyperextension of the joint. It is the structure that is most commonly injured in dogs. In fact, more than 600,000 dogs in the U.S. have surgery for this problem every year. The stifle also has two half-moon shaped cartilage structures between the weight-bearing bone ends called menisci. There are two menisci in each stifle, one on the inner side of the joint called the medial meniscus and one on the outer side of the joint called the lateral meniscus. The menisci add support to the stifle and also serve as shock absorbers by spreading the weight load. The top of the tibia bone, called the tibial plateau is angled downward. When the CrCL is torn, weight-bearing forces cause the femur bone to slide down this slope. Not only is this painful, but it also causes the stifle to shift out of place during weight-bearing movement. As the femur slides down the tibial plateau, the meniscal cartilage, a cushion between the bones that acts as a shock absorber, may be crushed. In about 50% of the dogs with CrCL injuries, the meniscal cartilage has been injured as well. This type of injury is often accompanied by a “click” that can be heard when a dog walks. When the CrCL is weakened or torn, the most significant long-term change in the joint is the development of arthritis. Most dogs with a complete CrCL tear show an immediate onset of lameness. While there may be some initial improvement over several days, there usually is a dramatic decline in limb function over time. 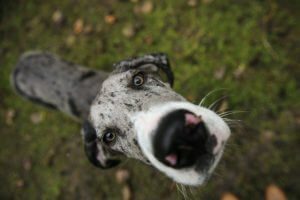 Dogs that have a partial CrCL tear may have persistent lameness on the affected limb; yet others have stiffness or lameness on the limb after taking a nap or while exercising. Your veterinarian may detect swelling in the knee and instability in the stifle upon examination of the joint. Dogs that have a partially torn CrCL may not have any detectable instability of the joint, and X-rays of the joint may be needed to support the diagnosis. The lateral fabellar technique is primarily recommended for small dogs and cats. Although this technique can be used to treat cranial cruciate rupture in large breed dogs, they have a greater risk of loosening the bands and a poorer outcome. The initial part of the surgery is joint “housekeeping.” This involves removal of remnants of the torn cruciate ligament and inspection of the joint for other problems. If the meniscus cartilage is torn, the damaged part of the cartilage structure is removed. Two very strong sutures are passed around the small bone called the lateral fabella located on the backside of the knee and then through a hole drilled in the top of the tibia bone. These sutures are placed in the same orientation as the cranial cruciate ligament; therefore, the instability of the knee is eliminated. During the healing process, scar tissue develops on the side of the joint, which permanently keeps the knee stable. Restriction of activity is therefore important so that the strong sutures do not prematurely loosen before the scar tissue has developed. 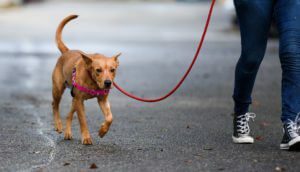 Generally, most small dogs and cats respond well to the imbrication surgery, with resolution of lameness after the healing process is complete. With time, arthritis will develop in the knee of dogs that have a cruciate ligament tear, in spite of having surgery. Some dogs do not exhibit significant clinical signs of the arthritic changes in the knee; yet others show clinical signs of arthritis such as stiffness and lameness associated with heavy activity. Medication is available, should your companion experience signs of arthritis. The surgery that is recommended for medium and large breed dogs that have CrCL tears is the tibial plateau leveling osteotomy (TPLO). The TPLO levels the slope of the tibia by cutting the bone and rotating it. A plate is fastened onto the side of the bone with a set of screws to hold the tibia together during the healing process. The TPLO keeps the femur bone from shifting backward during weight-bearing activities and allows other supporting structures of the stifle to stabilize the joint. The TPLO procedure offer multiple benefits in comparison to older techniques including faster recovery; earlier use of the limb after surgery; better chance to return to athletic activity; and better range of motion of the joint. The TPLO procedure is currently the best method available for stabilizing a dog’s knee. 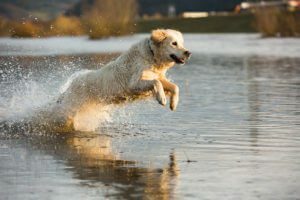 With good rehabilitation, 90% of dogs undergoing this surgery can expect to return to athletic activity within six months.